A young child’s receptive language develops sooner than their expressive language. This means they are capable of understanding much more than they can express. Honoring this intellectual development can be difficult when you feel you are constantly met with the one-word answer “no!” or a temper tantrum. You feel like you just asked a simple question or you just suggested a meal of his favorite food and you look down to find your child flailing on the floor. How did this happen? Communicating with your young child with respect is what lays the foundation for how he will relate and communicate with others as he gets older. Using a calm and clear voice helps him feel your sincerity and honest nature. He looks to you for guidance as he builds his personality from the people and experiences around him. Staying calm and clear can be difficult to remember when your toddler has dropped to the floor and is crying “no” and neither of you know why. Although this situation may not always be avoidable, often it is. You can prepare for this moment my using clear, honest, and positive communication from the start. That’s right, from the moment he is born you can start communicating your trust in his development. And it is never too late to start! 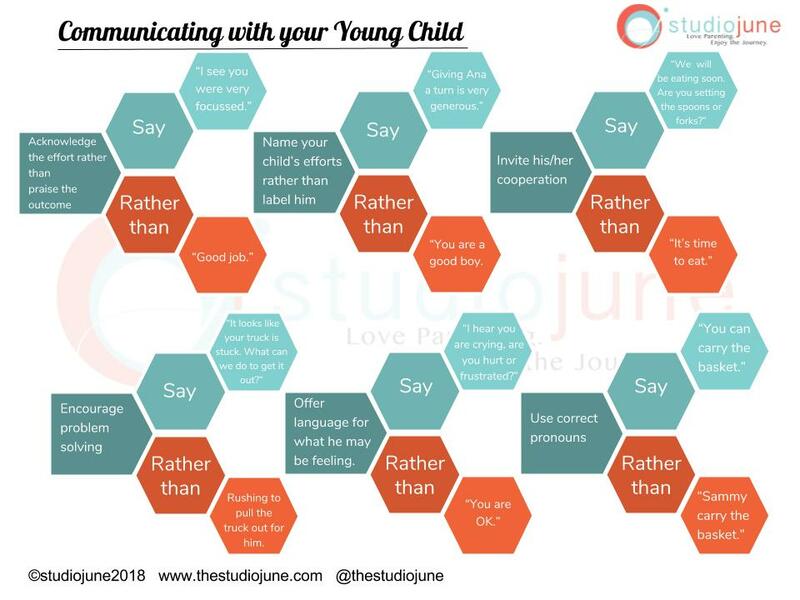 Children of all ages respond well to positive and honest communication. Using consistent positive phrasing as your communication style helps your child understand when he has the opportunity for choice and input. Toddlers often feel everything is decided for them and out of their control. They are newly aware that they have choice, can contribute to family life, and they are seeking autonomy. They express it by saying, “no!” even when they may really want to say yes. We can support them as they learn that their contribution matters and that they truly have an important voice by not putting them in a situation where they can say no. We can Invite them to participate in community life whenever possible and set them up for seeing their role as a contributor not a bystander. Attached is a chart of six common situations with young children. By changing just a few words you may find that your young child is much more cooperative and engaged in family life. And you may even see fewer tantrums!